British legendary model Naomi Campbell and Jody Watley. 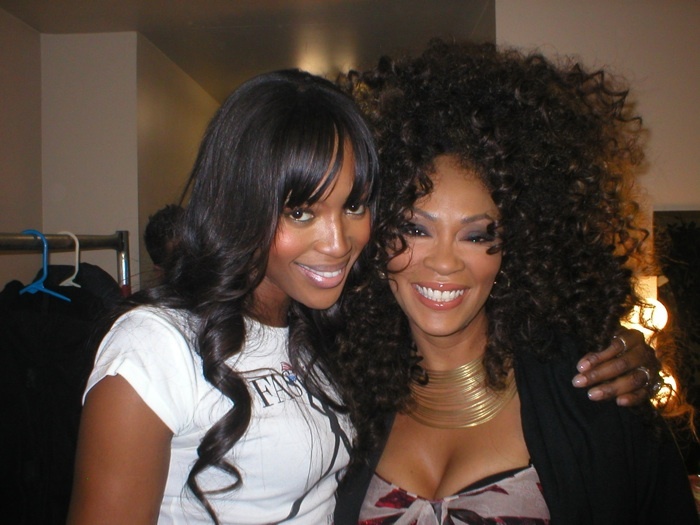 Naomi Campbell with Jody Watley, 2007. Growing up VOGUE and Harper’s Bazaar were always in our home thanks to my Mom. I’d cut out and tape photo’s to my wall of my favorite clothes and models I looked up to, right along with the music artists I loved in various collages. All of them provided inspiration for me; fueling my own dreams to reach for and achieve. As I got older my love for style, fashion and great models didn’t wane. I appreciate what they do and learned to work my angles through the lens of models like Naomi Campbell captured by renowned photographers..not to mention appreciating the poetry of ‘the walk’ on the runway. Like dancing, an individual touch is required to be memorable and Naomi took it to another level from other runway icons. I’ve been fortunate to meet several of my favorite legendary icons and inspirations including Pat Cleveland, Beverly Johnson and Naomi Campbell – all were incredibly nice and gracious I’m happy to say. This photo of Naomi Campbell and I was taken at a charity event in New York in 2007; I was one of the performers and she was one of the hosts. We were equally enthusiastic to see each other after so many years. She and I had met over a decade before at a party for Herb Ritts I was attending with my former make-up artist Paul Starr. Naomi was one of Paul’s many famous clients. He’d often tell me anecdotes when he used a new lip color or product on me saying “Ms. Naomi loves this..” – that meant he knew I would too. The night of the Herb Ritts party she took my hand with Paul and introduced me to her friends and other models in attendance proclaiming “This is Jody Watley, my big sister and she makes the best music!” That she was a huge fan of my style and music was of course appreciated and yes – I thought it to be very cool. Even when you’re a famous person – you can still be a fan and have mutual respect..and gush a little. Naomi recently celebrated her 42 birthday – and of course is still every bit of fierce. Happy Birthday Ms. Naomi! Naomi Campbell at 16 for YSL.